Elsewhere on the Rick’s Picks home page, I’ve offered a mildly bullish short-term projection for the E-Mini S&Ps. However, I proffer the Mini-Dow’s chart (see inset) as a cautionary note, since Thursday’s downdraft did impressive damage to the hourly chart. 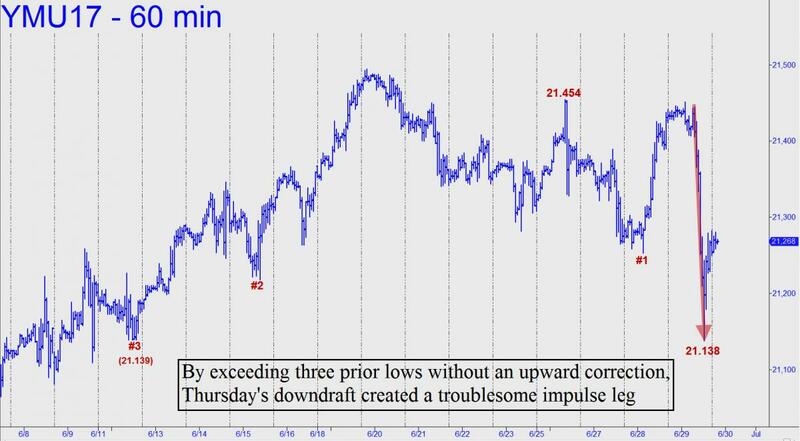 Specifically, it exceeded three prior lows, two of them ‘external’, without an upward correction. We’ll get a better sense of how serious this is if and when the futures roll over and take a second leg down. If it should reach or exceed the down-trending abc pattern’s ‘d’ target, that would have bearish implications at least for the near term. For the moment, however, the September contract is rebounding moderately in after-hours trading. If the rally were to continue, exceeding the 21.454 ‘external’ peak that I’ve labeled, DaBoyz would have shorts seriously on the run ahead of the holiday weekend. It will be interesting to see how things play out in any event, but I’d suggest watching from the sidelines on Friday unless you fancy tangling with a mongoose.